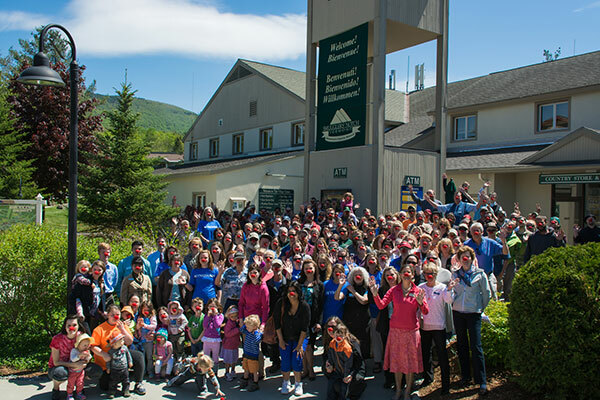 At Smugglers' Notch Resort, we strive to continually be a positive force in our community. It is important to our culture that we be considered a business of highest ethics by our neighbors, our guests, our vendors and suppliers, and others with whom we interact. We are proud to help support a number of Vermont non-profits through donation, employee involvement and other means. Honoring donation requests is one of the key ways we support community causes that benefit residents of Vermont. Typically, Smugglers' supports the fundraising raffles of Vermont non-profits by donating Bash Badge ski & ride passes. An average of 200 Bash Badges are donated each year in response to donation requests from Vermont non-profits. Children have visited Smugglers' through Make-A-Wish from Florida, Tennessee, Missouri, North Carolina, Massachusetts, New Jersey, and New York. While most visits have involved the wish to see snow and enjoy snow play, some children and their families have gone to Smugglers' during the summer to simply spend time together and have fun at the resort's mountainside location. Visiting children and their families enjoy a full Smugglers' vacation, including condominium lodging, plentiful activities, and in the winter, ski and snowboard rental equipment and instruction, daily lift tickets, and use of the resort's amenities. Families especially enjoy the thrill of snow tubing. During the summertime, favorites with families include the children's programs, family games and activities, and the pools and waterslides at the resort. Beyond the resort amenities, the resort vendors and staff are committed to make each wish as special as can be. Vendors contribute to wishes depending on each family's interests, providing food or fun experiences like sleigh rides or zip line tours. Staff members donate items such as holiday tree ornaments, handmade toys, delicious treats, cards, and Vermont mementos to the visiting families. The wish children are even included in the traditions of the resort. Those who stayed during the holidays have participated in the candle-lighting ceremony on Christmas Eve, and one wish child rode the first chair on the new Mogul Mouse Magic Lift as the guest of honor in 1994. Smugglers' Notch Resort owner Bill Stritzler describes the resort's longtime experience granting wishes by saying, "It has been very gratifying for us at Smugglers' to work with the folks at Make-A-Wish of Vermont over the years to support the visits of young wish recipients and their families. Their goal on vacation is the same one held by all our guests: to relax, have fun, and enjoy time together. We consider ourselves privileged to provide the setting for their special moments." Each Winter for the past five years, students in the 4th, 5th, and 6th grades at Cambridge Elementary have been given the opportunity to experience Smugglers' terrain three days during the winter season. They can choose to learn to ski, snowboard, cross-country ski or snowshoe. A 5th grade teacher who has seen students grow and blossom as they learn new skills, camaraderie, and confidence, says that about half of the 4th graders entering the program have never before participated in these activities. She credits the 100% participation level in those grades to the fact that the cost is wholly underwritten by Rotary and Height of Land fundraising activities. Smugglers' discounts the cost of participation and rental equipment for program. On a typical 4th grade trip day, 60 9- and 10-year olds board the bus and head up to the mountain. Teachers and Rotary volunteers come along to help with equipment and encouragement. All the children choose their own activity, and can change from one to another sport during the season. They are given 2 hours of lessons and time to practice what they learn. Children with special needs are given one-on-one coaching through Smuggs Special Needs Adaptive Program (SNAP). As the students progress to 5th and 6th grades, they can attain many levels of proficiency. Each Winter season, Smugglers' sponsors Cambridge Day for resort neighbors, offering free lift tickets, ski and snowboard equipment rentals and group lessons to residents of Cambridge and Jeffersonville to enjoy the resort's three mountains. For several years, Smugglers' has participated in the annual Winter Trails Day. This program, sponsored by Snowsports Industries of America, typically draws local residents to try cross country skiing or snowshoeing. We're pleased to give these visitors the opportunity to sign up for a short introductory session and then access the resort's trail network for the day at no charge. Smugglers' is a sponsor of WinterFest, a community celebration of all that's fun about winter, which takes place on the final full weekend of January. We generally host a cross country ski or snowshoe trek as part of the festivities. The resort donates gently used appliances and furniture to Cambridge 360 and Recycle North in Burlington. Smugglers' provides shuttle service to support local events like the Festival of the Arts and the historical society's Civil War days. Resort management and staff have served and continue to serve on many boards including the Vermont Business Roundtable, the Vermont Nature Conservancy, Vermont Public Television, the Vermont Economic Progress Council, the Lamoille Economic Development Corporation, Copley Health Systems, Lamoille County Planning Commission, Town of Cambridge Economic Development Advisory Board, Cambridge Artists and Entrepreneurs, Cambridge 360, Mary Bryan Art Gallery, Town of Cambridge Senior Housing Advisory Board, and the Cambridge Food Shelf. If we can organize a drive or run a race for a cause, we do! Resort staff have organized coin drives to support the Vermont March of Dimes, walked to support the Lamoille Area Cancer Network, and set up food drives for the Cambridge Food Shelf. From "Blue Jeans for Babies" to Thanksgiving turkey donations, these efforts receive a lot of support. Smugglers' Notch Resort and Wyndham Vacation Ownership at Smugglers' Notch supported Lamoille County non profit organizations on May 21, 2015 as part of Red Nose Day, a campaign to raise awareness of the challenges of poverty for children and young adults. This was the first year in the United States for the campaign, which has been held in the United Kingdom for many years. More than 100 employees answered Smugglers' managing director Bill Stritzler's challenge to wear red noses for a group photo, which led to a donation of $750 to the Cambridge Food Shelf by Smugglers' and a donation of $750 to the Lamoille Family Center by Wyndham Vacation Ownership at Smugglers'. Smugglers' also donated $500 to the Lamoille County United Way. In addition, resort employees held a food drive for the Cambridge Food Shelf. In Summer 2014, accepting the challenge from Ski Vermont, resort owner Bill Stritzler and many employees happily participated in the Ice Bucket Challenge to raise awareness for ALS/Lou Gehrig's Disease. Smugglers' donated $540 to ALS New England and sent the challenge on to another Vermont ski resort.